I am me, Clare McNamara, wife, mother, sister, friend and successful business woman. But, picture this. I’m in the doctor’s office and I’m crying. I feel exhausted, completely overwhelmed and ridiculous. At 29, towards the end of a difficult pregnancy, my then husband has an affair. I find out a week before my son is born, 6 weeks premature and much smaller than he should be. Two months later my husband leaves. Needless to say it is a difficult time. The course takes a great turn. I marry a man who knows that love is not just about words. We have two sons but we discover my middle lad has Tourette Syndrome and Attention Deficit Hyperactivity Disorder (ADHD). This combination of neural difference makes learning a challenge and triggers a lot of anger. I try hard to help the teachers understand. We are told he will not achieve much academically. He is beaten up twice on top of the constant taunts about his tics. Now he’s at university studying computer science. It has been a rollercoaster and he is sometimes very low: slowly but surely we’re getting there and I’m back on course. Another bump in the road emerges. A year ago, after months of a horrible illness my mother dies. I cope really well, organise the funeral and support my father through a dark period of loneliness. I get a few migraines but that’s all. I keep going. Then I find out my sister has the disease that killed my mother. She fights it, but it is another major blow to see someone you love in distress. My doctor could see what I could not. I needed help and coaching to get me through this journey. There is still a stigma around mental health, and even now, eighteen months down the road, it’s not easy to disclose. After some amazing bereavement counselling from Cruse, and Cognitive Behavioural Therapy, I am in a much better place. In fact I feel great. 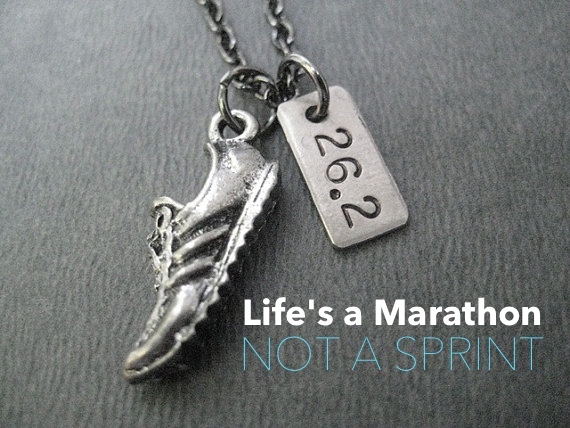 Life truly is a marathon, not a sprint. You don’t know what’s round the corner so you need to be prepared for anything. As my good friend Jenny Campbell has found, resilience is not so much about bouncing back from adversity, rather it is proactively ’building flexibility, being able to learn, understanding one’s capacity for change, and anticipating the barriers to change’. Oprah says ‘turn your wounds into wisdom’. My story means I add a unique dimension to the work I do with Global Leaders who face complexity, ambiguity and relationship issues daily. I can say with conviction that every cloud has a silver lining if you look hard enough. The wobble I experienced forced me to rest and over time see both my strengths and limitations. Without it I might still be struggling on, surviving but not thriving. Know yourself and do what’s necessary to keep your energy levels high: the one-size-fits-all training plans just don’t cut it. Just as in a marathon training schedule you would take account of age, reasons for wanting to get fit, recent injuries, health problems, dislikes and likes and what sports facilities you have access to, in life you need to understand the thinking and communication styles that are natural for you. For me that includes long walks and lots f visuals like movies to counteract the relentless tedium of organizing family chores and keeping everyone else on track. Find ways to be efficient and set up structures that work for you and enable you to avoid procrastination and focus on what’s important. Apply the oxygen mask to yourself first,for everyone’s sake. Listen to your body and get help when it is screaming for it. Tap into your support team, your coaches, physiotherapists, nutritionists and sport psychologists. Reach out to friends – people want to support you, just as you would them. If you are in burn out or heading for it, read Tim Cantopher’s ‘The Curse of the Strong’. Better still, pace your efforts so that you avoid the need for emergency help in the first place – constant sprints and no rest are a sure-fire recipe for exhaustion. Don’t judge a book by its cover. If someone is driving you mad, find out what’s really going on or causing the behaviour. Is it a ligament problem or a bone issue? Think about disabilities as ‘diffabilities’ and find the hidden gifts. Everyone has something unique and special to offer. Helping them to excel promotes fulfillment and is good for all of you. Find something to ground you spiritually and when you can, offer up your worries and relinquish control.Resilience is as much about learning to let go as it is about being strong. I am fortunate enough to have a Christian faith which gives me hope and the knowledge that I am loved unconditionally, always. My well-honed resilience was needed again in January this year when my other sister was diagnosed with breast cancer and required a mastectomy. She too is a brave fighter and has come through her ordeal stronger. So when I had a recall on a mammogram last month and underwent a biopsy and then another because the first was inconclusive, I had to pull out all the stops to stay positive. The oxygen mask went back on pretty fast this time! Luckily, I am now in the clear. Initially I was reluctant to tell this story. My instinct as a British woman is not to draw attention to myself or appear boastful. I have always drawn inspiration from Marianne Williamson’s poem ‘Our Deepest Fear’ and share my story so that others might be inspired. I hope it does. What are some of your strategies for coping through tough times? Where do you seek inspiration and coaching? Hi Claire, you’re article really did made me accept something, that i had been avoiding for some time now. I feel exhausted very often and I am mad about it. Being a mom of a toddler and working is not as enjoyable as i thought it would be. I am going to get help for me physically and mentally. Thank you for the great article and for sharing your experience bravely. So glad my article has got you to this point of acceptance Sowbarnika – the only way now is up. Your toddler is going to thank you for putting on the oxygen mask. I will send positive thoughts and prayers. Life throws curve balls at us just when we thought we were in the up. This time last year I was given the news that I had to return to the UK from Houston by the end of August and that I would no longer be on the project I had dedicated from life to for four years. I know not the same as some of the things that you ladies have discussed but this really through me. I felt useless, a waste of space a failure to my wife and family as the future looked poor for us. These feelings come from my mental health illness that I have suffered with for the past 32 years, these feelings were part of the survivors guilt I have. I always looked on the dark side always negative. This time though after the initial anger I sat down and spoke with my wonderful wife who helped me put things in to perspective, ladies are good at that. So I treated it as a positive, I was made redundant back in January after 15 years with the company but that was a blessing for us. I have been able to spend time with my wife talking, laughing and having fun, yes I am still unemployed and the money is starting to get short but hey thats life. As the Monty Python song goes, Always look on the bright side of life. Mark thank you for sharing this. The time to go sometimes is the best time to take your wings and fly. Life is cut short by so much. If we stay upset, we continue down the same old path. When we choose to see things differently, we soar. When you want to feel bad (because old habits die hard), watch this. I’m so glad I’ve come to know you and really appreciate you putting yourself out there. It takes a lot of courage. You’re #awesome! Katie thanks for sharing that very powerful clip, I am going to share it with my family and friends. Thanks for your kind words and I am so glad we have hooked up. Hello Mark. I know that you telling your story will help many others in similar situations. You say that it is not the same as some of the things ‘we ladies have discussed’. Don’t underplay your experiences, they are just as powerful, only different. By talking to your wife you have put your oxygen mask on. Katie is right, you have been very courageous. You are clearly reflecting on what is right for you and this can only mean you will get closer to the moment when you can take the leap and fly. That’s really interesting Sue, and kind. It’s funny, the people I was most worried about sharing it were my British friends! It is still just not ‘the done thing’ to flag up your successes in Britain, especially as a woman. Glad you see that it doesn’t detract and in facts helps connection. I too am looking forward to meeting. Does it count that you shared it on an American hosted website? Just kidding. I’m glad you did. What inspiration you’ve created for so many, Clare. I am always amazed that whenever life hits a low or truly tests us (and this week has certainly been a testing one for me), a bit of inspiration will pop up from one of the many connections in my life. Thank you Clare for being my ‘Inspiration Angel’ this week – for your courage to share your experience and great advice. It is enabling me to put things in much better perspective! As a thank you, it’s been a while since we last had a coffee & cake catch up so hope we can have a get together soon. Sue I am honoured to be your ‘Inspiration Angel’. I am able to do this right now because of the many people who have been there as Inspiration Angels for me. I hope that by getting things into perspective you are truly putting on your oxygen mask. Coffee and cake sounds great! Hi Clare. I’m probably not your intended audience but I found your story moving and hope you won’t mind if I comment. You begin by painting a picture of yourself but it could be any one of us. Outwardly successful and happy, inwardly exhausted and confused by our body’s response to the constant battles to control the system within which we live and work. Eventually we break and are brought to the difficult realisation that we are not the image we have of ourselves. Our deepest assumption, life is a struggle and if it is to be lived successfully we require training and resilience, whether a marathon or a sprint life is a race that must be prepared for. We need to be fitter, to try harder. Are we really so inadequate or is it possible that our mental models cause us to act in ways that our inconsistent with what it means to be truly human? I suggest that it is not a lack of skill or endurance that is the cause of the significant problems we face. The skills we choose to develop, the training we undertake, are a consequence of the way we think about the world and our place in it, but we rarely question the way we think. Change doesn’t happen at the level of doing, it happens at the level of our thinking. We cannot control systems but, as Donella Meadows said in her wonderful book Thinking in Systems, we can learn to dance with them. All metaphors breakdown at some point and the metaphor of life as a race does so sooner than many. Life is what is happening between us now as you read these lines, it is in every press of these keys and in every thought as I type. How do we prepare for a race as we run it? We cannot. To misquote John Lennon the metaphor suggests life is what happens to us whilst we’re busy preparing for it! I think we spend much of our time trying to remove from our lives the things we don’t want rather than on creating the lives we do want. We spend our time in a reactive struggle, problem solving, rather than in intentionally designing the future we want. An absence of the things we don’t want in our lives doesn’t create the lives we do want. One reason this might be happening is because to design the future we want we must first understand who we are. You say you are a wife, mother, sister, friend and successful business woman. These are roles you play they are not who you are. How do we discover who we truly are? Hello Richard. 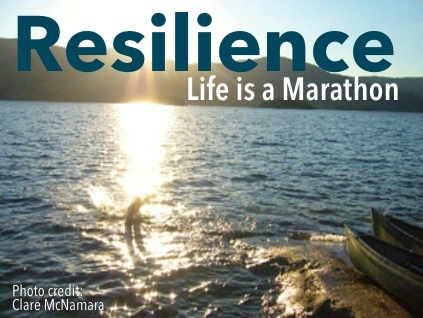 Anyone who is interested in resilience is ‘my intended audience.’ I appreciate your very thoughtful response. I like your point suggesting that the way we think about the world is a major factor in whether we are able to live successfully. ‘Change doesn’t happen at the level of doing, it happens at the level of our thinking’ is a great way of putting it. You are right, in my view, when you say that it is not possible to really prepare for life as you would prepare for a race as life is happening all the time. However I do think you can think ahead and increase the chances of responding positively to the curve balls that get thrown and to make sure you pace yourself correctly. If you can let go and, as Katie says, take your wings and fly, the rewards can be great. Great question ‘How do we discover who we truly are?’ Perhaps we never can but I feel I have got much closer recently by doing a number of things. These include looking back over my childhood and observing what I was doing when I was at my happiest, researching how my brain works most happily (Katherine Benziger’s thinking style assessment worked really well for me) and exploring my deeply held values. RIchard, I love your comments and you are precisely the audience 🙂 Your response got me thinking. I’ve been on a career sabbatical. It’s the first time I’ve ever had to “deal” with not being busy, slowing down, taking my own medicine and really thinking about what I want. I’ve spent a great deal of time trying to get to know who I am and now I want to put that into something more meaningful. I wrote for years in silence and didn’t share. A year ago I decided to begin sharing my thoughts and also encoring others to do the same, just as you and Clare have done here. It’s made me realize I’m in the mode of creating and not in a reactive struggle. It took slowing down and thinking more (albeit this crazy world we live in), and seeing others come into their own space that has made me realize I’m precisely where I need to and want to be. Thanks for sharing your thoughts. You certainly made me think more. I believe it is not about the roles we have but about the relationships we build particularly if those relationships are reciprocal and based on a foundation of respect. Our relationships reflect our true self. It’s true we can get hung up on what has gone wrong and forget what has gone well especially as a lot of what goes well happens in the ordinariness of life. The wonderful, gentle moments that may lack drama but provide lasting impact. It is in these moments that we shine. Sir Ludwig Guttmann, founder of the Paralympic Games said ‘Did you think you would make a plan and life would obediently follow it’. Stuff happens and as Clare says we need to build resilience to overcome some of the uphill moments but we also need to fortitude to celebrate our life at the same time. Clare starts her comment with a true reflection of herself – ‘I am me’. Then goes on not to describe the roles she fulfils, but the relationships she has built. The respect based, value driven, love filled relationships that reflect her and her character. I am me, Francine Brooks, and I am proud to be Clare McNamara’s friend and colleague. Francine I am truly proud to be your friend too. I love what you say about the wonderful gentle moments which lack drama but nevertheless have tremendous impact. I had a difficult moment today and then read your response which helped me put everything back into perspective and reminded me of the importance of being true to oneself. You have helped me, as Katie says, come into my own space.